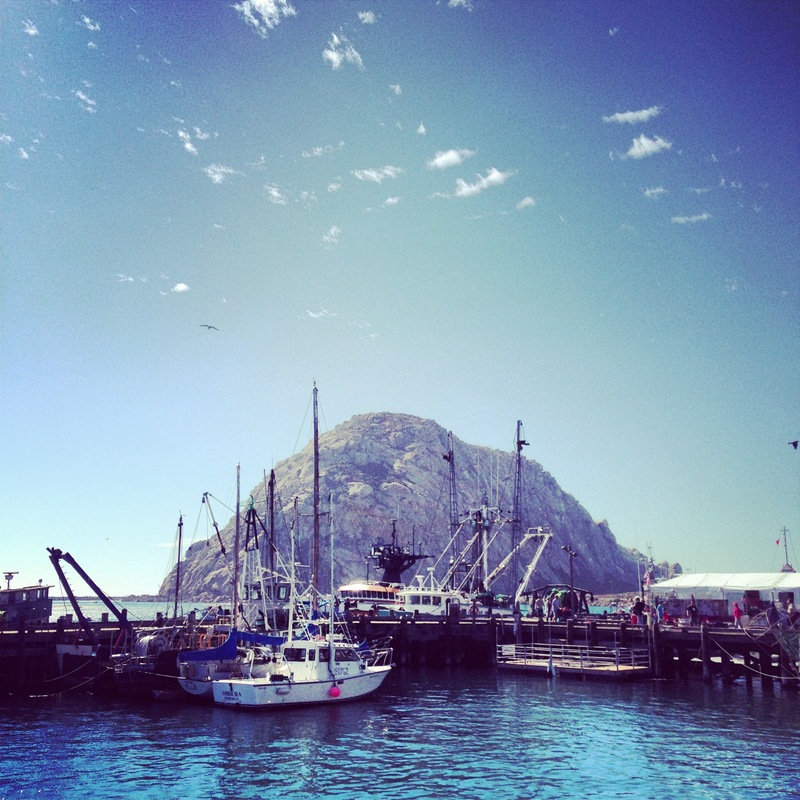 Morro Rock, in Morro Bay. You’ll be seeing a lot of this big fella. It makes sense that after writing an entire post about “balance,” that’d I’d completely abandon my blog, right? Yeesh, have I been away for a while. Sorry ’bout that. But seriously. I guess I just felt like I needed some space. Not from you all, or the blog in general, but, like, real physical space. So, I’ve been spending a lot of time outdoors, and very little time writing. This, as you can imagine, is both good and bad. On the one hand, my summer tan has extended itself into an autumn tan, which is worth at least +25 awesome-points. On the other hand, well, I’ve been completely MIA, and since writing is somewhat cathartic for me, I’m starting to get a little antsy. But I have an idea! And I think you’ll enjoy it. I felt as if I was taking this amazing location for granted, and that if I didn’t snap out of it soon, me and my family would be stuck in a rut of just existing here, rather than truly living here. Does that make sense? We’d keep on doing the work-home-sleep, work-home-sleep shuffle until we’re too old to hike 128 some-odd hiking trails in the area. And that simply won’t do. Of course, not all of my “Vacation Life” posts will be breathtaking sunsets and seaside panoramas. Because what else do people do on their vacations? They relax. They treat themselves. They spend quality time with their family. So I’ll share that stuff, too. So, I’m inviting you all to get to know us Godseys a little better, and join us as we try and make the most of where we live. I hope you enjoy it! And who knows? Maybe some of you will dig a bit deeper into what makes your towns special, too. And if you do, please let me know! I would love to see/read more about y’all and where you’re from! For starters, here’s a panorama I took of the sunset last week. We were barbecuing, and suddenly: BLAMMO. Pink and orange everywhere. So I ran on up to the crow’s nest and snapped this quick photo with my iPhone. (Say what you will about the Maps app in iOS 6, but the panorama feature is totally worth it.) You can click on the picture to see it full-sized. Hey I’ve been reading your blog for the past 6 months and have also been sharing it with my mom. We really enjoy your perspective and occasional food for thought. My mom wanted me to comment and let you know that she liked the telephone pole in your panoramic picture. Random comment (I know), but there it is. Besides, what’s life without random comments? You know what’s funny? At first I thought that the pole detracted from the image, and I was going to retouch it out of the picture. But I decided against it, because life isn’t like that, you know? Sometimes there are telephone poles in the picture, and that’s okay. 🙂 So I’m really glad someone actually LIKED it! I love this! I live in a city I love and for several years it was where we vacationed. Austin is my husband’s hometown and the city that holds my heart. It can be easy to miss things. This is a great way to rediscover and find new things. There is no shortage. I’m going to sound like a crazy, but that panoramic totally made me cry. Just a lot of things going on right now and it helped me remember how big God is and he’s got it under control. I always love sunrises and sunsets and I’m totally jealous of your crow’s nest and that view. I have this yucky suburban-houses-and-trees-in-the-way view. Miss your posts and looking forward to more. Sorry for being off topic, but I wanted to share this with you. Next time you see Mark, ask him to turn in his geek card. Holy moley! I’m not sure I want to live in a world where we’re sharing 1,000 times as many things as we do today! I already feel like an over-sharer! Yikes.